Find the Bittercup artifact and persuade Eydis Fire-Eye to betray the Camonna Tong. Talk to Gentleman Jim Stacey at Simine Fralinie's Bookshop in Vivec's Foreign Quarter for a new job. Travel to Ald Redaynia to obtain the Bittercup. Travel to the Guild of Fighters in Balmora and talk to Eydis Fire-Eye. Return to Gentleman Jim Stacey in Vivec. Gentleman Jim Stacey at Simine Fralinie's Bookshop in Vivec, Foreign Quarter Canalworks, asks you to persuade Eydis Fire-Eye in Balmora to join the Thieves Guild's cause against the Camonna Tong. He suggests that Eydis might betray the Camonna Tong if you offer her the Bittercup, an artifact sacred to the followers of Clavicus Vile. The artifact can be found in the ruins of Ald Redaynia, on the islands north of the Urshilaku Camp (it should be marked on your map). The outside of Ald Redaynia is guarded by two Skeleton Archers. The door to the right-hand side after entering (level 75 lock) leads to the Bittercup. The key to this door is in the lower area of the cave, on top of some crates (the key also opens the submerged chest in the same area where it is found). Open the locked door that leads to the Bittercup and defeat the four monsters. A Skeleton War-Wizard will appear after defeating these monsters. Loot the Skeleton War-Wizard's corpse for a Vampiric Ring. 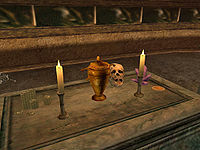 Examine the Bittercup on the central altar, and choose whether to drink from it or pick it up. The Bittercup will disappear forever after selecting the option to drink from it, but adds 20 pts to the highest attribute and subtracts 20 from the lowest attribute (the Bittercup is needed to finish the quest). Travel back to Balmora and offer the Bittercup to Eydis Fire-Eye in the Guild of Fighters to get her to pledge allegiance to the Thieves Guild. Return to Gentleman Jim Stacey to complete the quest. If you wish to keep and use the cup yourself, you can just kill Eydis and still complete the quest successfully, minus the grandmaster lockpick reward. If you wish to be part of the Fighters Guild too, finish all of Eydis' quests and take on the Remove Sjoring's Supporters quest, and you'll have to kill Eydis if you didn't give her the cup. If you give her the cup, she will not have it on her when she dies. A fast way to get to Ald Redaynia is to take the Guild Guide to Sadrith Mora, take a boat to Dagon Fel, and then travel on foot. Alternatively, you can take a boat from Gnaar Mok to Khuul then swim northeast. Water Walking highly recommended. If your highest attribute is already above 80, drinking from the cup will not increase it past 100, but will still reduce your lowest stat by the full 20 points. However, if you have an item equipped raising an attribute over 100, the bitter cup will still add an additional 20 points to that stat. The name of this quest and the dialogue topic spell "Bitter Cup" as two words, but the actual artifact is listed as one word: "Bittercup". A minor discrepancy. Once this quest is complete, you may receive an infinite number of free Grandmaster's Picks from Jim. Simply bring up the topic of the Bitter Cup again in conversation with him, and you will receive another lockpick each time. 10 Gentleman Jim Stacey asked me to get the Bitter Cup, an artifact sacred to Clavicus Vile, and deliver it to Eydis Fire-Eye. The Bitter Cup was lost in the ruins of Ald Redaynia. 25 I sipped the potent nectar of the Bitter Cup. It bestowed its "gift" upon me, and then it promptly vanished. 30 Instead of delivering the Bitter Cup to Eydis Fire-Eye as Gentleman Jim Stacey had requested, I sipped its potent nectar. The Cup bestowed its "gift" upon me, and then it promptly vanished. 50 Eydis Fire-Eye accepted the Bitter Cup and agreed to betray Sjoring Hard-Heart's orders to crush the Thieves Guild. 100 Finishes quest Gentleman Jim Stacey thanked me for delivering the Bitter Cup to Eydis Fire-Eye. 110 Finishes quest Gentleman Jim Stacey was displeased that I botched the bribery of Eydis Fire-Eye. But he said he might have done the same himself, given the circumstances. 120 Finishes quest Since Eydis Fire-Eye is dead, there is little we can do to bribe her.